The original Southern Belle was a streamlined passenger train that ran between Kansas City and New Orleans from 1940 until 1969. Thanks to the Kansas City Southern, a new, beautifully-restored Southern Belle streamliner train is now used for business meetings, public affairs and charitable events. Before it was merged into the Union Pacific in 1982, the Missouri Pacific was a vast railroad system operating in eleven states. The UP has honored the MP with a beautiful Heritage locomotive. Classic Streamliners – A Festivus Miracle! 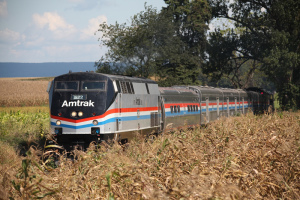 Since 2011, the Amtrak Exhibit Train has travelled the United States to showcase the 40 plus year history of Amtrak, its current railway operations, and its future goals for high-speed passenger travel. On Saturday, May 17th and Sunday, May 18th, that train will visit the historic Cheyenne Depot Museum in Cheyenne, Wyoming. 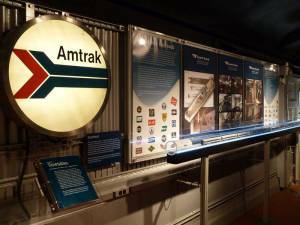 The Amtrak Exhibit Train offers a free, self-guided tour of exhibits, artifacts, and Amtrak memorabilia. 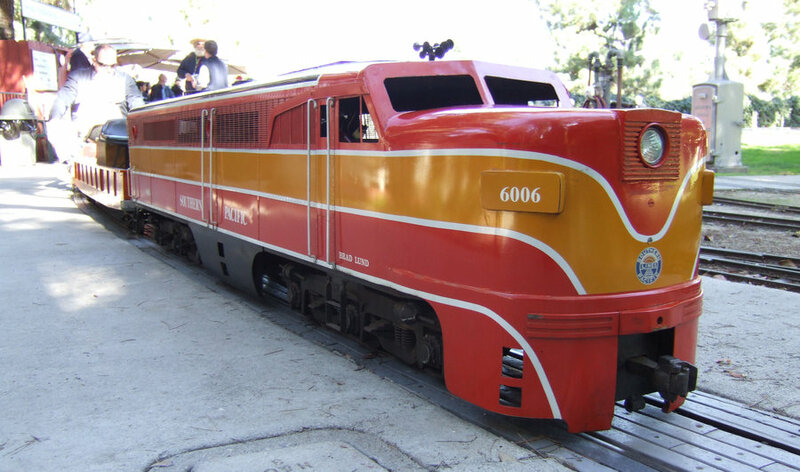 Pulled by a diesel-electric locomotive, there are three display cars and a gift shop car at the end of the train. The visit coincides with the 9th Annual Cheyenne Depot Days. Built by Henry Van Brunt for the Union Pacific in 1886, the depot was donated to the City of Cheyenne and Laramie County in 1993. The Cheyenne Depot Museum, via walk-thru exhibits, provides the history of Cheyenne from the arrival of the transcontinental railroad. This writer visited the museum in 2013 and the detail and lay-out are very impressive.Cheyenne, Wyoming, has been very much an intersection for the railway world of late. On May 8th, the steam train Big Boy 4014 arrived from California to be rebuilt in the local Union Pacific steam shop for future use as an excursion train. Additionally, the upcoming fourth season of AMC’s Hell on Wheels, which dramatizes the building of the first transcontinental railroad, will begin with the historic Cheyenne founded in 1867. A postcard depicting a General Motor’s Aerotrain. From the back of the card: The New York Central System “The Road to the Future.” A General Motors “Aerotrain” is shown on display here at Buffalo, New York in Feb. of 1956. The train failed in regular operation and was in service on the Central less than a year. It was part of a futile effort to upgrade passenger service. Similar units were used briefly on the Pennsylvania and the Union Pacific Railroads. By 1969 the Road to the Future had proved to be the Road to Ruin. The card was distributed in 1970 by Owen Davies, Bookseller. THE FLORIDA SUNBEAM was operated by the New York Central System, the Southern Railway System, and the Seaboard Airline Railroad. On Jan. 1, 1936 the Florida Sunbeam was inaugurated as a winter-only train between Cincinnati and both coasts of Florida with through cars from Great Lakes cities. 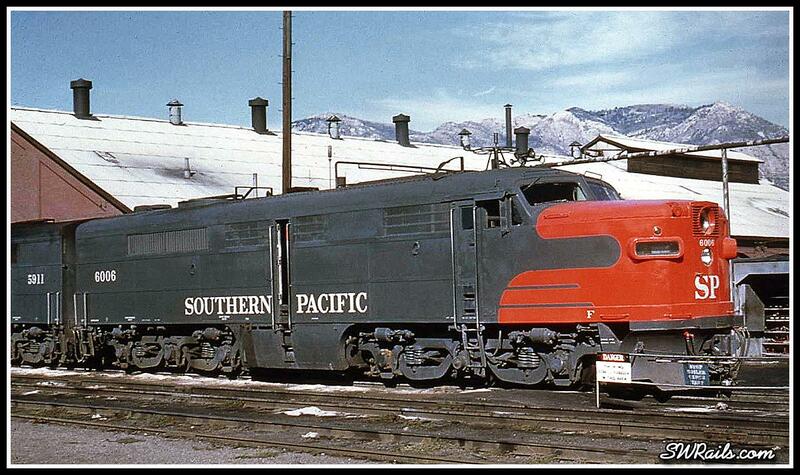 In 1949 it was replaced with the much faster, streamlined NEW ROYAL PALM on a changed routing. This linen postcard depicts an ALCO DL-109 diesel locomotive pulling the train. It was advertised as being diesel powered between Cincinnati, Ohio and Valdosta, Georgia. Postcard photo of the streamliner City of Los Angeles near Sterling, Illinois and traveling along the Rock River. The train is pulled by a EMC E2 locomotive. The City of Los Angeles was a streamlined passenger train between Chicago, Illinois, and Los Angeles, California via Omaha, Nebraska, and Ogden, Utah. 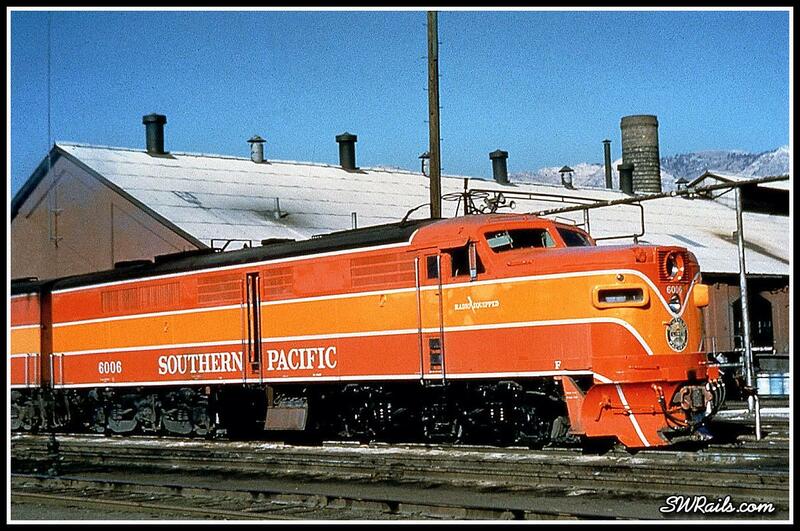 Between Omaha and Los Angeles it ran on the Union Pacific Railroad; east of Omaha it ran on the Chicago and North Western Railway until October 1955 and on the Milwaukee Road thereafter. This train was the top-of-the-line for the Union Pacific, which marketed it as a competitor to the Super Chief, a streamlined passenger train on the Atchison, Topeka and Santa Fe Railway, and the Golden State, a streamlined passenger train jointly operated by the Rock Island and Southern Pacific railroads. As with the City of Los Angeles, many of the train’s cars bore the names of locales in and around its namesake city. Circa late 1940s. The Flying Yankee was a diesel-powered streamliner built in 1935 for the Maine Central Railroad and the Boston and Maine Railroad by Budd Company and with mechanical and electrical equipment from Electro-Motive Corporation. It was also the name of a passenger train, the third streamliner train in North America after the Union Pacific Railroad’s M-10000 and the Chicago, Burlington and Quincy Railroad’s Pioneer Zephyr; the Flying Yankee was, in fact, a virtual clone of the latter, except that it dispensed with the baggage/mail space to seat 142 in three articulated cars. The Cincinnatian was a named passenger train operated by the Baltimore and Ohio Railroad (B&O). The B&O inaugurated service on January 19, 1947, with service between Baltimore, Maryland and Cincinnati, Ohio, essentially a truncated route of the B&O’s National Limited, which operated between Jersey City, New Jersey and St. Louis, Missouri. The Cincinnatian is most famed for its original dedicated equipment, rebuilt in the B&O Mount Clare Shops. The design work was done by Olive Dennis, a pioneering civil engineer employed by the railroad and appointed by Daniel Willard to special position in charge of such work for passenger service. The livery used the blue and gray scheme designed by Otto Kuhler, which Dennis laid on the engine and tender in a pattern of horizontal stripes and angled lines. In 1950, its route was changed to travel between Detroit and Cincinnati; the train kept this route until 1971, when Amtrak assumed passenger rail service. Postcard photo of the Baltimore and Ohio train The Cincinnatian when it was a streamlined steam locomotive. The locomotive shown is No. 5301, “The President Adams”, a 4-6-2 Pacific style locomotive. This photo was taken in July 1956; just a few months later, the beautiful steam-powered streamlined locomotive would be replaced by a more modern and cost-effective diesel. This is a linen type card that was popular circa 1930s to early 1950s. Streamlined locomotives and trains began in the early to mid 1930s with the lightweight diesel trains such as the Pioneer Zephyr. 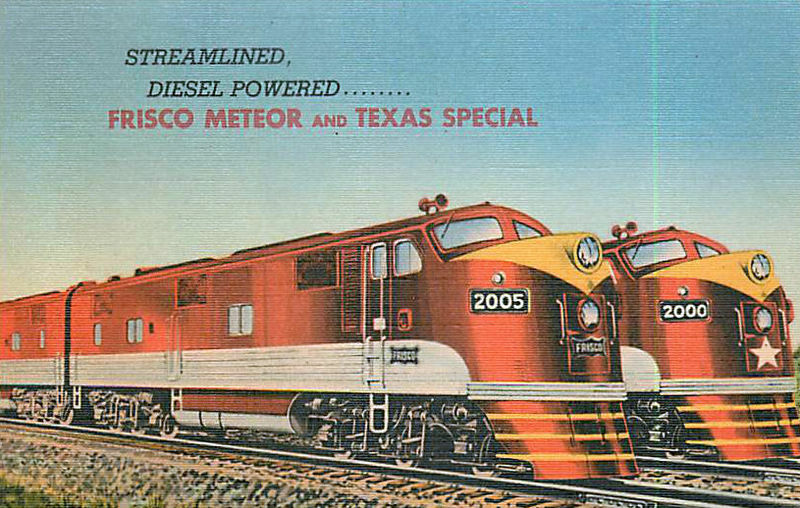 By the late 1940s to early 1950s, diesel powered locomotives were in common use for passenger service. This card is likely from the 1930s to 1940s. The Roger Williams was a streamlined, six car, lightweight, DMU passenger train, built by the Budd Company in 1956 for the New York, New Haven and Hartford Railroad. The train was based on Budd’s successful RDC DMU cars. The end two cars were equipped with streamlined locomotive style cabs and noses, resembling those on the Fairbanks-Morse P-12-42 Diesel locomotives. The four intermediate cars lacked operating controls and cabs. For operation into Grand Central Terminal, the cars were each equipped with third-rail shoes, and small traction motors, allowing them to operate into the terminal under electric power, with their engines shut down. After a short period of time in high speed service, the train was split up, and the cars were used in service with the New Haven’s other RDCs. They worked for the New Haven, Penn Central, and Amtrak, until the last cars were retired in the 1980s. The 2 end cars, and one intermediate car, are preserved in operating condition, by a private owner, at the Hobo Railroad in Lincoln, New Hampshire. The City of Kansas City was a streamlined passenger train operated by the Wabash Railroad and its successor the Norfolk and Western Railway between St. Louis and Kansas City, Missouri. It operated from 1947 to 1968. At the time of its introduction it was the only streamliner which operated entirely within the state of Missouri. The City of Kansas City commenced operating on November 26, 1947, and made a daily 278-mile round trip schedule between St. Louis and Kansas City. At the time of its introduction it was the only streamliner which operated entirely within the state of Missouri. General Omar Bradley, a native Missourian who as a young man had worked on the Wabash, christened the new train. Primarily a daylight train, No. 3 departed St. Louis at 8:45am, and arrived in KC at 2:15pm. The consist was then turned around and readied for the eastbound trip as No. 12, departing KC at 3:55pm, and arriving in St. Louis at 9:45pm. The American Car and Foundry Company built the original seven-car consist in their St. Charles, Missouri plant in the suburbs of St. Louis. Cars included a baggage car, baggage-mail car, two 58-seat coaches, a lunch counter-coach, a dining car, and a parlor-observation car. The interior of the parlor-observation car was designed according to Pullman Plan #9001 and Pullman managed the car, as it did with all the Wabash parlor cars. The Norfolk and Western Railway leased the Wabash in 1964 but did not discontinue the City of Kansas City until February 1968. See more vintage passenger trains at http://www.classicstreamliners.com and follow us on Facebook at http://www.facebook.com/railstream.